We’ve reached November and this is my first Tweet Tasting of 2016 organised by the Whisky Wire. These events can offer a snapshot of a brand or distillery that normally is out of your price range or are just entering the market. In the case of whiskies and bourbons I find it a useful tool to gauge potential without trying to track down bottles or distributors. An added incentive was the 2016 Roundtable discussion where I had added a topic to the agenda around the validity of the format of Tweet Tastings. Unfortunately losing track of time, my plan was to engage in a tasting prior to the event and not afterwards as it turned out. Instead you can read the participants opinions on such events through their own experiences here. Lets move onto Rebel Yell. In the UK you’re more than likely to think of that godawful Billy Idol song, which funnily enough was inspired by the whiskey. Any regular supermarket shopper will testify just how popular bourbons and American whiskies are becoming on the shelves. I believe there are a couple of reasons for this including their attractive pricing and managing to tap into the younger end of the market. If you see a young adult with a spirit bottle nowadays its more likely to be a bourbon equivalent than the latest NAS from Laphroaig. The Rebel Yell recipe was created in 1849 at the infamous distillery later known as Stitzel-Weller yet the brand itself wasn’t created and registered until 1936. Nowadays the brand is distilled under contract (a common approach in America) at the Heaven Hill distillery in Louisville, Kentucky. Like we’ve seen from other brands Stateside, Rebel Yell has embraced the flavoured end of the market. These weren’t included on the menu for our Tweet Tasting but if you fancy experiencing a root beer or ginger exponent then this is the brand for you. A mash featuring wheat, malted barley and corn. Nose: vanilla custard and fresh oranges with lashings of butterscotch. Plenty of wood but not rough and in-yer-face like some bourbons can unfortunately be. Stewed apples and marshmallows continue the sweetness, with maple syrup and honey granola bar. Taste: a touch of spice on the finish but prior to this its vanilla, chocolate, a bit of black pepper and more resin towards that finish. Overall: solid entry level bourbon, actually better than some more famous brands I can mention. Very approachable and does the job without taking your wallet for a ride. Nose: for whatever reason this reminds me of cold marble. Molasses with a rum influence, dried oranges, cloves and honey sweetness. With water more cinnamon and tarragon making this rye an engaging but simple profile. Taste: vanilla mixed in with the roughage of wood and an everlasting finish of wood shavings. Cranberries, chocolate and all-spice are present. Overall: a perfectly acceptable rye albeit a little shallow and industrial. Nose: vanilla and peaches with a sprinkling of coconut equals a great dessert. Then the sawdust kicks in with brass rubbing, melted butter and black pepper. More spices are evident with cloves and cinnamon plus rolled tobacco. Taste: a mouthful of resin tinged with vanilla and brown sugar. Plenty of honey laced cornflakes and the finish is a rustic encounter with wood chips. Overall: more a rugged offering than the staple straight bourbon. It lacks that refinement that will appeal to those wanting a little more character and bravado. 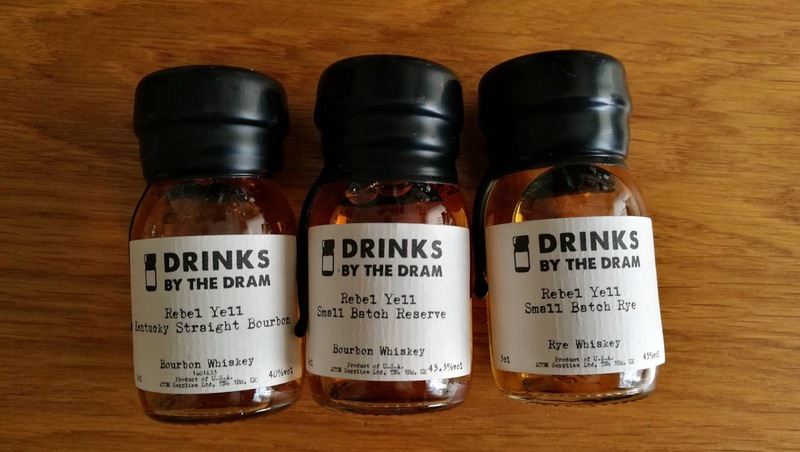 It’s a solid trio from Rebel Yell, which comes in the mid-range level for bourbons in the UK. Looking at the retail prices (which can vary) the straight bourbon is the best of the bunch, as the others are on the wrong side of £30 for me. I’d be quite happy with the entry bottling and some classic Americana on vinyl to pass an evening in good company, or a good bourbon. Next articleSMWS 72.49 Totally Scrummy! 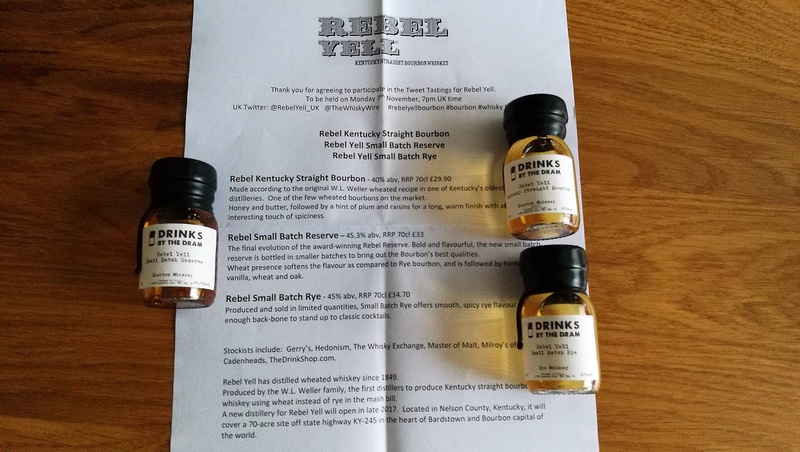 Yes another Tweet Tasting after my participation in the Rebel Yell event earlier this month. These formats are viable experiences to gain a foothold in..
Next: SMWS 72.49 Totally Scrummy!